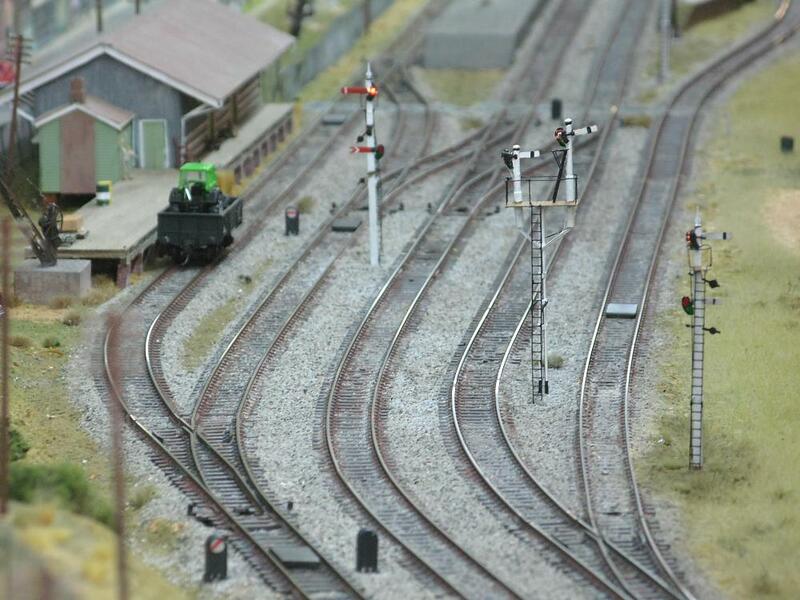 View to the goods shed showing the semaphore and dwarf signals added to the layout. Lit by a 0.8mm warm white LED, the spectacle plate on the Up Home semaphore can be clearly seen indicating the signal in the stop position. Since our first exhibition of the year, the signalling system has seen a couple of minor updates. The detection portion of the PICAXE program was modified to ensure more reliable operation under differing light conditions. To achieve this, a laptop was connected to one of the boards in order to take a range of readings directly from the light dependent resistors (LDRs). These readings became the baseline to change how accurate the threshold of detection is, and how often readings are taken to automatically adjust the threshold of detection. The system also received an update in the form of dwarf signals added to Wallerawang yard. Made by Uneek from white metal, these were painted and added at places based on the signalling diagram of the real location. The dwarf signals are dummies and do not operate when trains are passing. Wooden crates and pallets sit on the Dexion-style pallet racking, while the finished products, packed in cartons, are still waiting for the late delivery truck. Metal scrap bins are kept down the back of the yard. 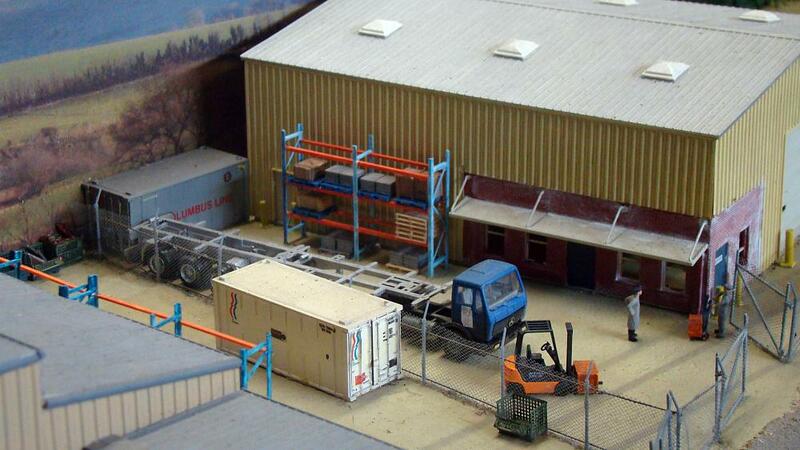 The pallet racking in the industry yards, scratchbuilt from styrene, has been loaded up with boxes, crates and pallets. 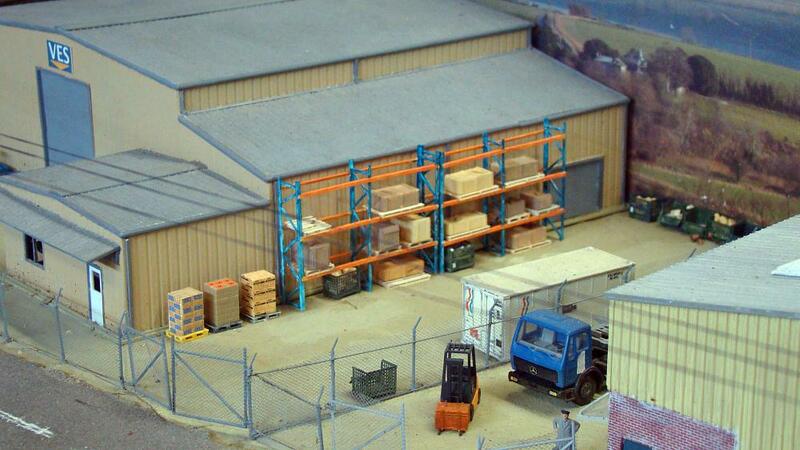 These were purchased in bulk packs from Preiser and Kibri, painted or had stickers added, loaded and added to the racks and the yard area. The storeman, seen here talking to one of his off-siders in the yard, now has an easier job with the pallet racking now at his disposal. Yellow bollards added last year can been seen next to the front and side doors of the building. On the main street of Wallerawang, in the grassed area between the station and the goods shed, is some playground equipment. 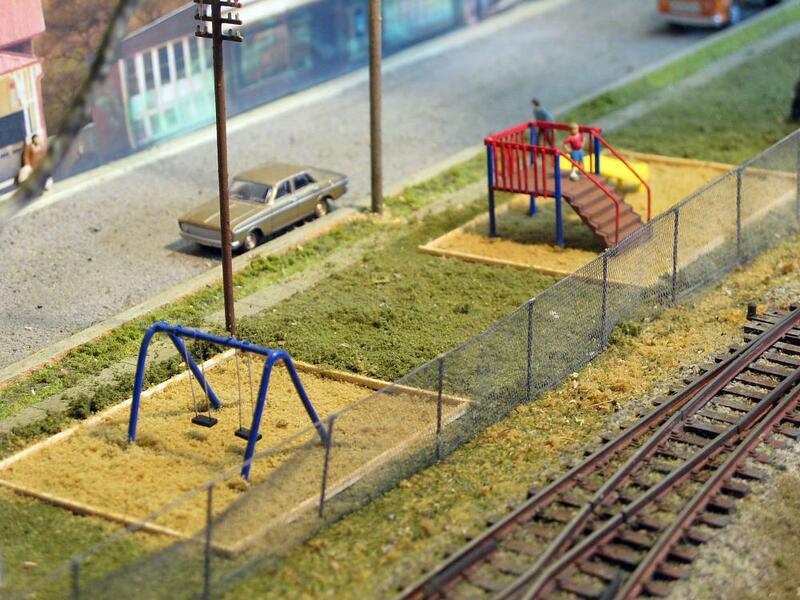 Needing to model the swing set and slippery dip, we searched for available kits from a variety of manufacturers but found none that were suitable. We decided to build them from scratch from the site photos we had. A young boy pauses in his play to watch one of the many long trains make its way through Wallerawang station. The swing frame was made from solid copper wire, soldered together where the crossbar meets the two bent end pieces. The swing seats are small pieces of styrene, each with two small holes drilled on either side. Brass wire was bent into a U shape and pushed through each hole, with the bottom end of the U sitting hard up against the underside of the styrene seat. The top lengths of the brass wire were positioned against the top crossbar of the swing frame, and checked for the height of the seat off the ground. The brass wire was then wound around the top crossbar of the frame and soldered into place. A coat of paint completed the set - blue for the frame, black for the seats and silver grey for the seat supports. 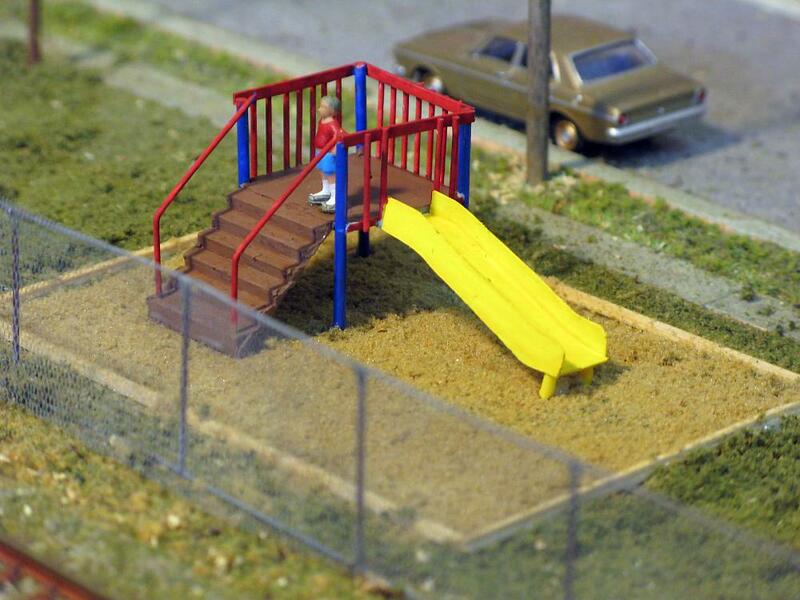 Side view of the play equipment showing its location along the main street. A pair of tables, scratchbuilt from styrene in December 2011, are further to the right just out of frame. The slippery dip and climbing frame was a little more complex to build. It is made out of styrene plastic glued together with MEK. A flat square piece represents the platform, into the four corners of which we drilled holes to accommodate the four support poles which are solid styrene rod. For the stairs we found an off-cut from an old footbridge kit that was suitable. The slide itself is a long thin piece of styrene bent to give it a flat section at the top and bottom. On either side of this we glued on flat styrene sides. At the base of the slide are two short pieces of rod to keep it off the ground. Around the top of the four poles we glued small square section styrene, and infilled each side with vertical bars represented by very small diameter rod. 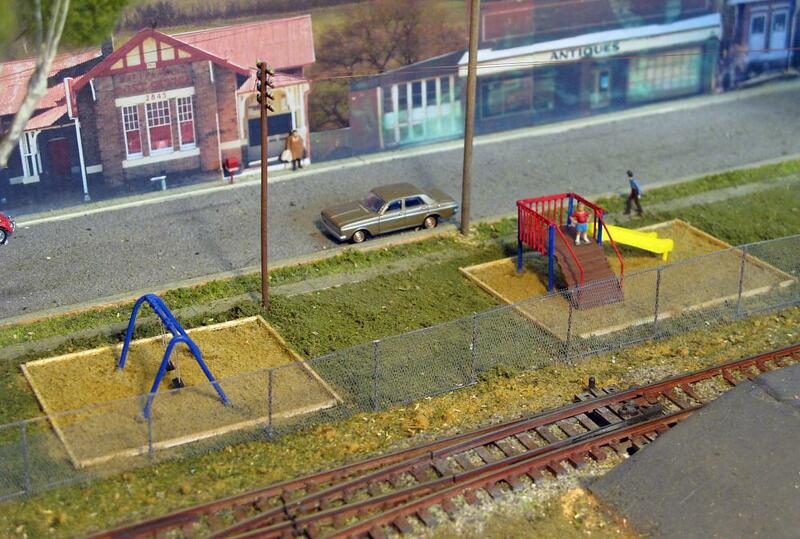 We don't want our HO scale children to fall off the platform. We painted the slippery dip set mainly in primary colours as per the prototype. Closer view of the slippery dip and its platform. The Australian standards were consulted to confirm the correct spacing of the vertical bars. The white blobs seen along the edges of the timber is glue that is still drying. At Wallerawang the swing set and slippery dip are each positioned in separate areas of 'soft-fall' which is contained within timber framing. Suitably sized North-Eastern stripwood was lightly stained and formed into two frames before being glued into position. Fine pale brown ground foam was stuck down to represent the soft-fall, and the swing set and slippery dip glued into place within their timber framed areas.